Every quilter, whether you are new or more experienced, should own this comprehensive guide to all quilting techniques. Packed full of expert advice on all aspects of quilting, patchwork and applique it holds the answer to all your quilting questions. This is the most comprehensive book on the market for patchwork, quilting and applique techniques and is ideal for both the beginner looking for trustworthy advice in a single volume and the committed quilter searching for authoritative reference for seldom-used techniques. 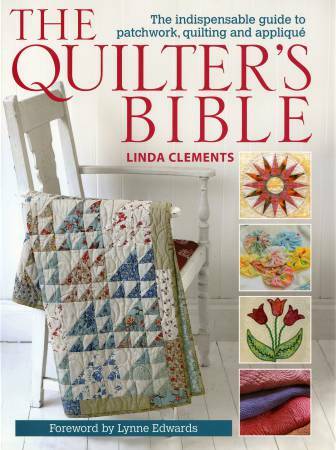 It presents essential advice and instructions alongside a wide range of inspirational samples of work collected from international top-name quilters. It also features over 15 quilt projects including cot quilts, bed quilts, lap quilts, bags, cushions, wall hangings, table mats and runners, and other beautiful projects for the home. Easy-to-follow step-by-step instructions, clear diagrams and stunning photography combine to create this must-have resource for quilters of all abilities. Techniques covered include quilting basics such as making a quilt sandwich, hand and machine quilting, basting and binding a quilt. Other techniques include big stitch, sashiko, free motion, corded and stuffed (trapunto) quilting. There are instructions for over 100 different patchwork blocks, with detailed instructions for different kinds of piecing such as English paper piecing, foundation piecing and strip piecing. Techniques for applique are also included which cover different types of applique such as needle-turn; reverse, inlaid and shadow applique as well as using freezer paper and fusible web.